Mailbox and post are included. The following items are sold separately: side plaque, door plaque, and top plaque. Mailbox and plaques ship separately from the post. Please allow 2-3 weeks for the Whitehall Mailbox to ship. Mounting kits, hardware and 4x4 post installation inserts are NOT included. 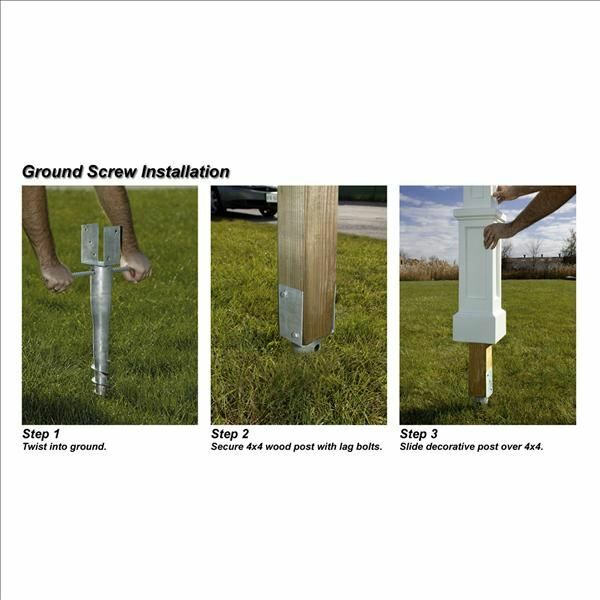 Post Requires Reinforced Installation to support mailboxes weighing more than 10 lbs. 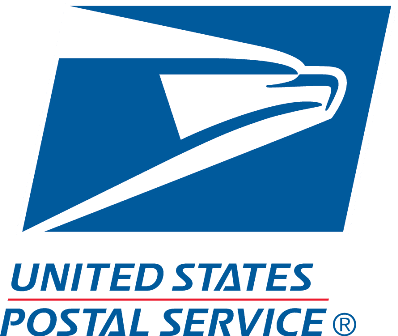 What is included with the Liberty Mailbox Package? The Liberty Mailbox Package pairs the classic Whitehall Streetside Mailbox with the New England-style charm of the Mayne Liberty Post. The combination results in an incredibly functional and highly distinctive presentation. It is unique in style, offers a commanding aesthetic and is equipped with a built-in Newspaper Holder. Talk about curb appeal! 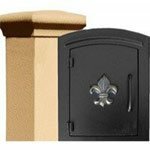 The Mayne Liberty Post is available in Black, White, Clay or Granite, to be paired with the Whitehall Streetside Mailbox in Bronze, Black, White or Green. The New England style Mayne Post paired with the classic Whitehall Mailbox adds timeless East Coast sophistication to your home's exterior. Personalized plaques create both ornateness and address locating convenience. * Two-sided Topper Plaque can contain up to sixteen 1.25 inch Characters. * Door Panel can contain up to six 1.75 inch Characters. 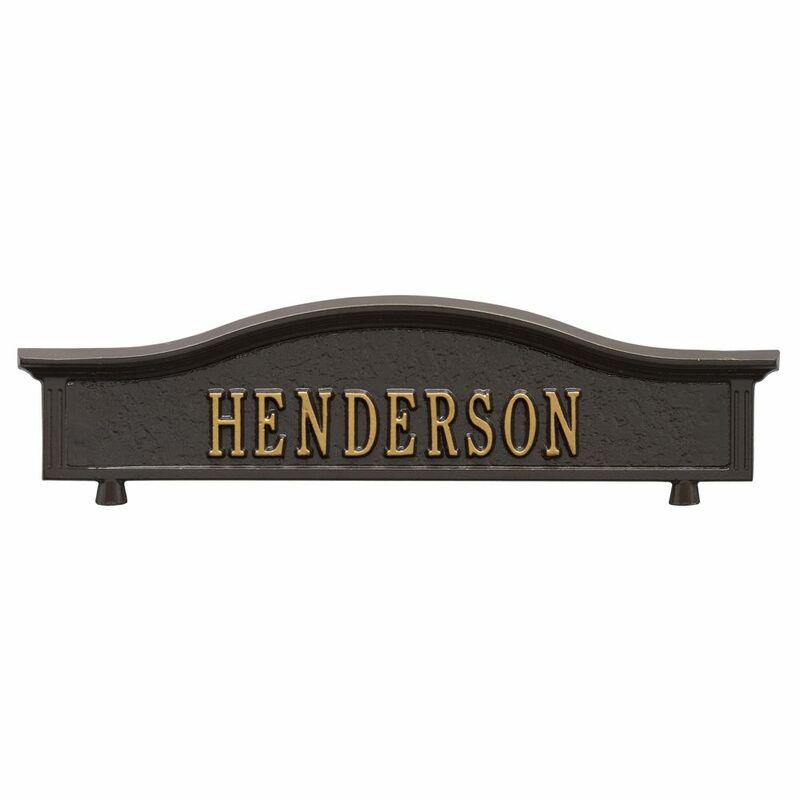 * Personalized Plaques feature gold characters atop the mailbox finish of your choice. 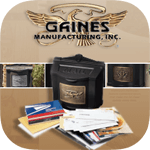 Black mailbox finish is available with silver characters; however, the outgoing mail flag is only available in gold. 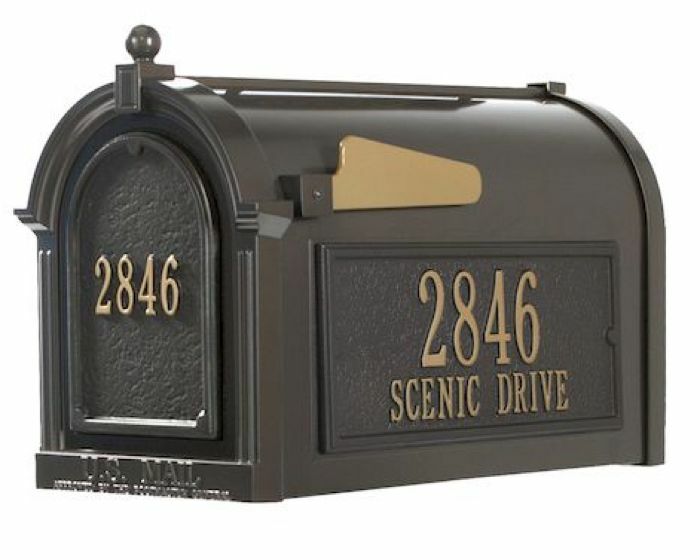 The Streetside Mailbox measures 9.625 in. L x 13 in. W x 20.375 in. H, which is 20% larger than a standard mailbox to accommodate multiple days' worth of mail, magazines, catalogs and larger parcels. Magazines and document mailers will lay flat, preventing tears and creases. 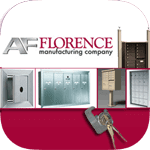 The smooth and sturdy hinged door operation with strong magnetic closure creates a watertight seal, ensuring all of your mail stays dry in any type of weather. Expertly crafted of die-cast, high density, 100% rust-free aluminum alloy for strength and durability. Finished with a highly-protective powder coating (Alumi-Shield™: a Whitehall Exclusive) that not only withstands the harshest weather conditions and environmental elements but is also resistant to chipping, scratching, fading and discoloration, keeping your mailbox pristine for years to come. 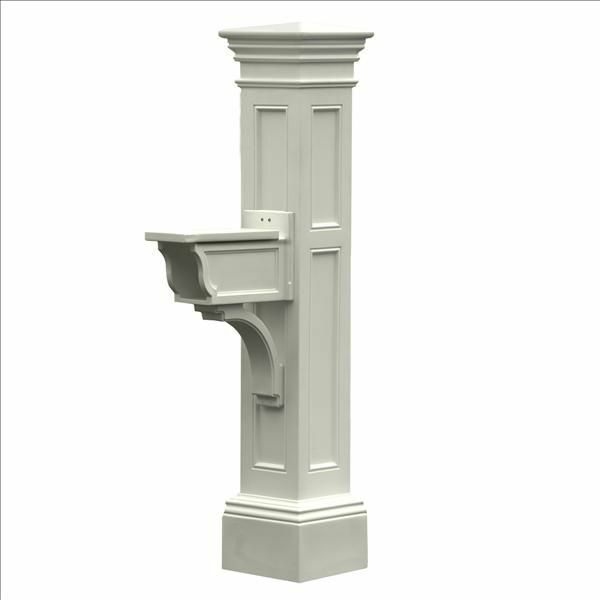 The Mayne Liberty Post with Support Arm and built-in Newspaper Holder measures 30.75"D x 14"W x 63.5H. The built-in Newspaper Holder ensures you never have to settle for a soggy Sunday edition or wayward gazette. 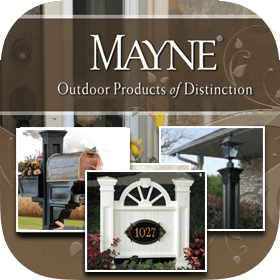 Waterproof and rust-proof, the Mayne Liberty Post is made from high-quality polyethylene with built-in UV inhibitors to ensure long-lasting protection from the harshest environmental factors and weather conditions. It is highly durable and oh-so-easy to clean. Moving soon? Not a problem! Simply relocate your mailbox and post and order new personalized plaques! 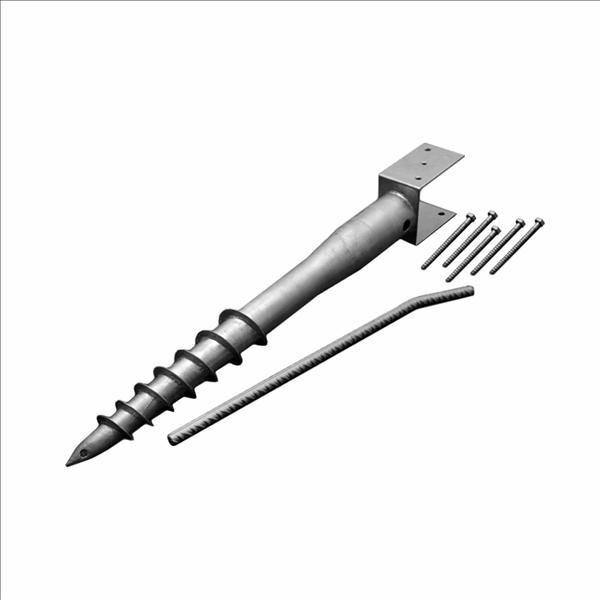 Mayne offers an optional No Dig Ground Screw for easy and convenient installation of the 4 x 4 mailbox post into the ground. The 27-inch tool will support and reduce the ground exposure of your mailbox post for long-lasting use. Complete assembly and installation instructions are available here and will are enclosed with your purchase. The Whitehall Streetside mailbox has many extra features which, if added, can cause the mailbox to weigh up to 30 pounds (more than the designated weight for Mayne Posts). 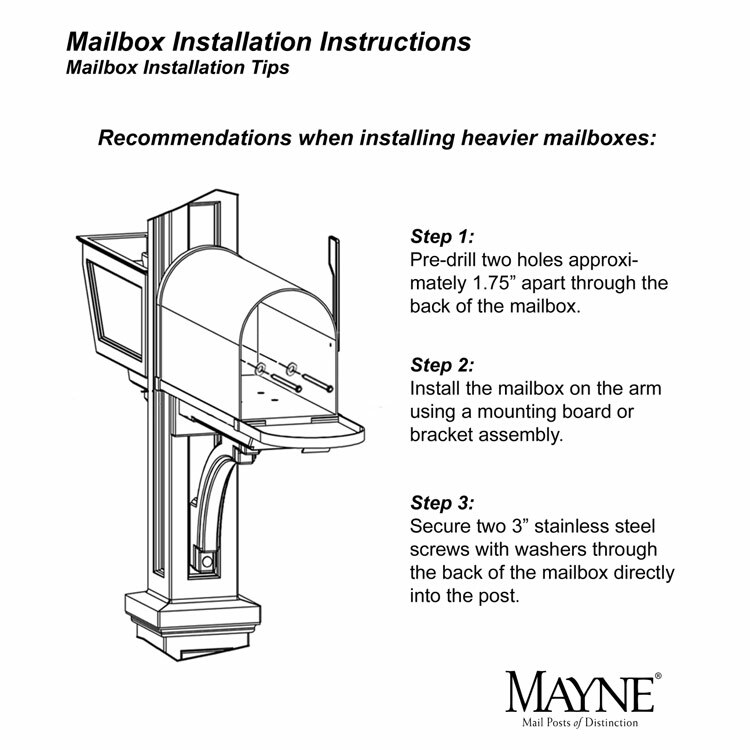 When mounting a mailbox this heavy on the Mayne Post, we advise drilling through the back of the mailbox with extra screws or bolts, directly into the post. This will provide optimal support for a mailbox weighing over 16 pounds. Regular screws long enough to reach into the 4 x 4 post are recommended. 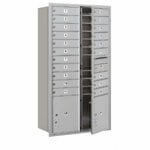 If the mailbox weighs over 16-20 pounds, we recommend larger diameter screws. 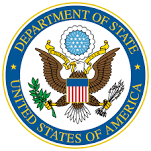 About the Manufacturer: Why Whitehall? Behind the legend of Whitehall artistry lies the tale of a unique craft inspired by the majestic shores and woodlands of western Michigan. It was a master wood carver's desire to reproduce and preserve his hand carved wood sculptures in metal, depicting the grace and essence of America's natural beauty. Over 75 years later, Whitehall Products still offers you the same mastery in detail and precision craftsmanship with each originally designed, carved and hand cast product. 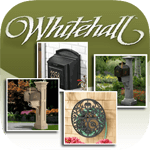 With over half a century of precision casting experience, Whitehall Products is renowned as the world's largest manufacturer of weathervanes, while also recognized for its extensive and superior line of personalized address plaques, mailboxes, and fine home and garden décor. An in-house design department creates and builds each product with distinctive styling and innovative function infused with American tradition and strength. Quality and elegance are trademarks of the Whitehall brand. Whitehall offers many personalized products that will add distinction and charm to any home. 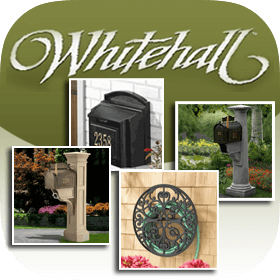 From address plaques and yard signs to personalized mailboxes and ornamental mailbox toppers, Whitehall products boast unmatched quality, timeless style, and superior functionality. 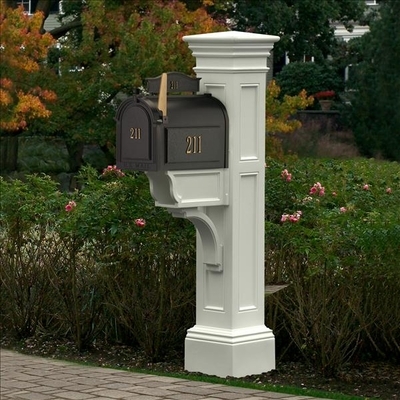 Adorn your Whitehall mailbox with a personal touch by choosing an ornamental topper that is specific to your interests, personalized Side Plaques to display your street number and name, a personalized Door Panel to display your house numbers, a personalized Two-sided Topper for your family name or, with the Balmoral mailbox, a clean and simple single-initial monogram. 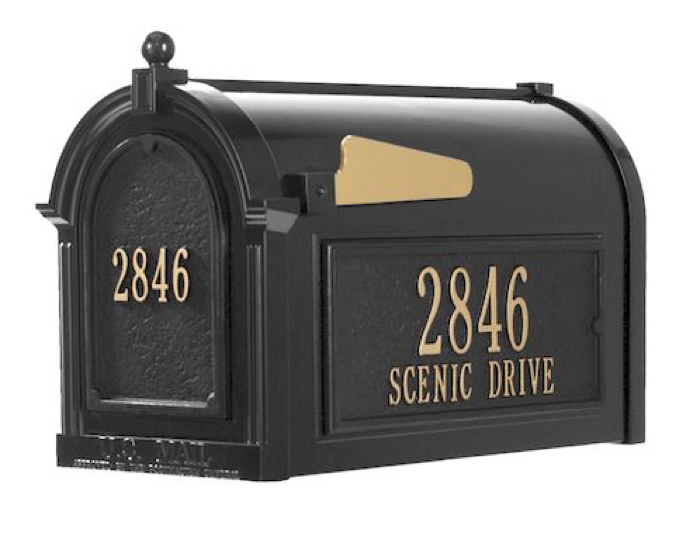 Your mailbox can display your individual personality, even displaying a word or phrase that is meaningful to you. 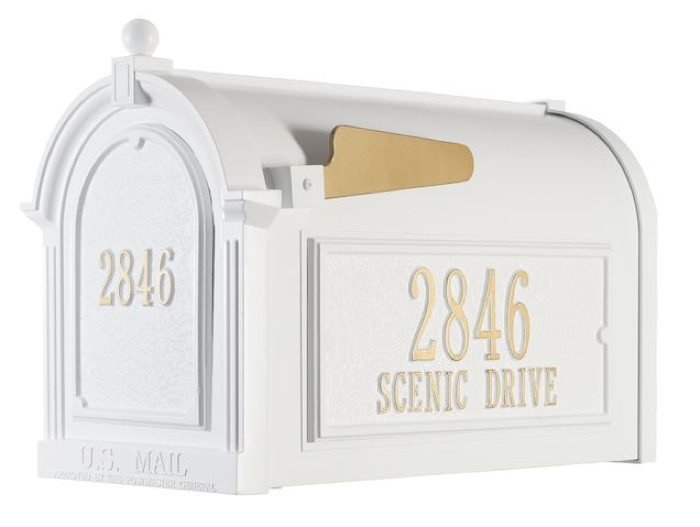 Each hand-crafted plaque features gold characters atop the mailbox finish of your choice and is created with the same precision and excellence as the mailbox itself. Whitehall is an excellent choice when choosing to display your personal identification details such as your address and name while adding your unique personality and style. 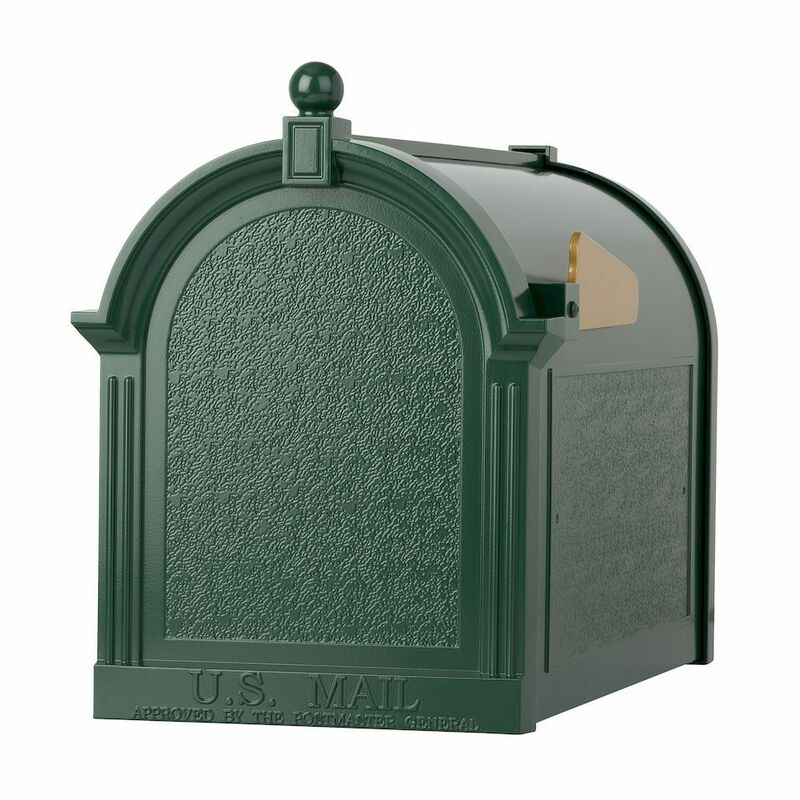 Black mailbox finishes are available with silver characters; however, the outgoing mail flag is only available in gold. 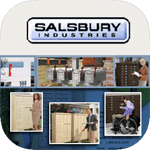 See our instructional video for how to install the side plaque to your Whitehall Mailbox. Never settle for a soggy Sunday edition or a wayward gazette! Whitehall Products stands behind their commitment to excellence with a Limited Lifetime Warranty against workmanship and material defects. 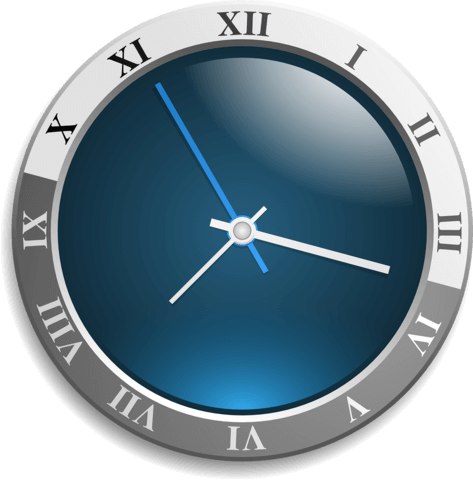 Whitehall's complete Lifetime Limited Warranty is included with your purchase.